Please note that the Yale Nex Touch (Formerly Arrow Revolution) is now Grade 1 commercial hardware. Don't forget to watch the video below on how they beat the heck out of this lock and it just kept on going! It's very impressive. The New NexTouch stand alone touchscreen lock combines the functional elements of a cylindrical lockset with the latest technological designed for electronic aesthetic. This new lock combines easy installation with very attractive and futuristic styling. 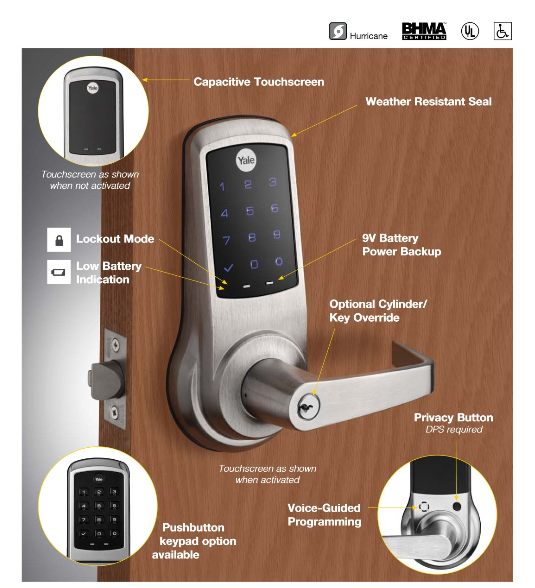 Using this lock is easy because of the voice guided keypad"
This makes day to day use and programming easy. The Revolution is recommended for healthcare facilities, offices, retail environments, multi-family, hospitality, government facilities, as well as K-12 school environments. It provides a traffic control solution for areas requiring restricted access. If necessary, both users and user groups can be easily locked out by the administrator. This feature provides a quick lockout option in case of a security concern. Lock can loose all battery poweer and still be activated either with a common 9 volt battery or the included backup key. See them beat the crap out of this lock! Install lock and latch with only 5 screws - easy! Latch Front: Stainless steel. 2-1/4" x 1-1/8", 1/8" in 2". Exposed Trim: Levers are pressure cast zinc. Streamline rose scalp of brass or bronze complements other series of lever locks. Warranty: Three-year and if you buy the Revolution from us we will throw in an extra year and include an easy return through us. You wont have to deal with the manufacturer at all!